Dante spent the first 292 days of his life in a hospital. He came into the world a lot sooner than expected; his mother, Mariarosa, was less than six months pregnant when he was born – and against all odds, he survived. At six weeks old, Dante developed necrotizing enterocolitis (NEC), a common condition in premature babies where the tissue in the intestine becomes injured or dies off, causing inflammation. 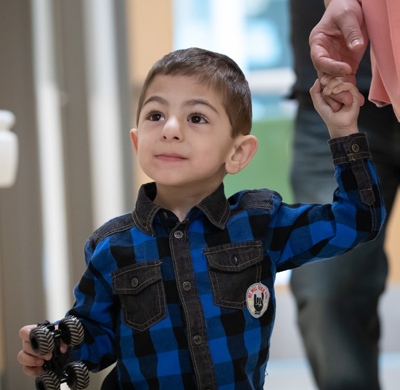 As a result, he was transferred from the Jewish General Hospital to the Montreal Children’s Hospital’s Neonatal Intensive Care Unit (NICU). The main difference between the two tubes is that the G tube delivers food directly into the stomach. It also meant that Mariarosa and Michael were one step closer to bringing Dante home. Then on June 21, 2016, their dream finally came true. “It was a very emotionally overwhelming day for us. We didn’t think our son was going to survive and now we were bringing him home,” recalls his mother. But Dante still had many more hurdles to overcome. 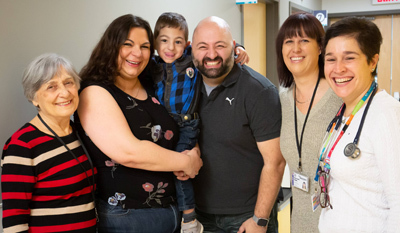 Shortly after being discharged, Dante began being followed by the MCH’s Neonatal Follow-up Clinic and met weekly with pediatric gastroenterologist, Dr. Ana Sant’Anna, and nutritionist, Marie-Josée Trempe. Because he had been gavage fed his entire life, he hadn’t developed the skills to eat, and was dependent on his G tube. “We didn’t want this to be a permanent solution, so we were eager to have it removed,” says Mariarosa. In order to help with the transition, the family was referred to Dr. Maria Ramsay, Director of the Children’s Pediatric Feeding Program. 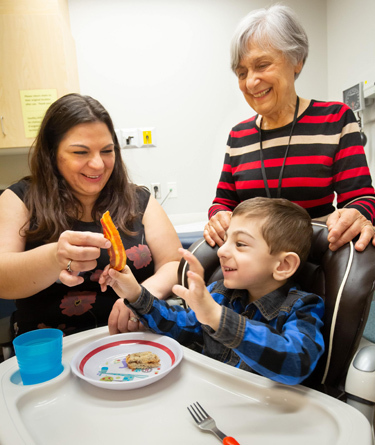 The program, whose patient population has doubled in size in the last five years, offers a multidisciplinary approach to evaluating and treating children with a variety of feeding problems, especially those who are dependent on a feeding tube. In an effort to continue to expose Dante to more food, he first had to stop his continuous feeding. “We started to give him three set meals of bolus feed throughout the day,” explains Mariarosa. Bolus feeding is a method of delivering formula from a syringe or pump into a feeding tube. “We needed him to get used to eating three meals a day like the rest of us,” she continues. Their son was then prescribed an appetite-stimulating medication. “For maximum effectiveness, it’s important to cycle the medication. For Dante that meant five days on it and two days off, because you don’t want the body to get used to it,” says Dr. Ramsay. During this time, Dante was being weighed regularly. He needed to gain weight before they could try weaning again. Then in November 2017, Dr. Ramsay and her team felt he was ready. On top of his two bolus feeds, Dante began eating pieces of food, like chunks of hamburger meat and of course, bacon. Over the next six months, Dante continued to eat food once a day, but he wasn’t gaining or losing weight. “Eventually we had to stop again and return to the three bolus feeds, because he was getting taller, but not fatter. He was dropping off the growth curve again,” says Mariarosa.